The FM-11 BS is a FM-11 EX without the 6809 cpu, only the 8088 remains. This was considered as an heresy by FM-11 fans. The FM-11 EX was already an hybrid machine introducing an 8088 CPU along the 6809 microprocessor caracterizing the FM-11 series. Thus removing the 6809 from the FM-11 architecture was indeed an additional step forward IBM PC compatibility which was not to fans liking. 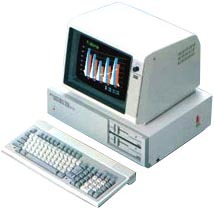 Thanks to its 8088 CPU, the FM-11 BS can run CP/M and CP/M 86 and MS-DOS operating systems. Contrary to first FM-11 systems (from 1982), the FM-11 BS is equiped with Chinese characters ROM (JIS Level 1 Kanji, Level 2 available in option). see more Fujitsu FM 11 BS Ebay auctions !